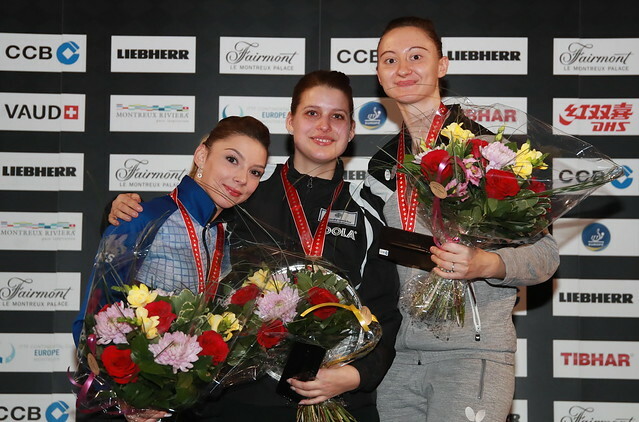 Gold medallists at the European Championships but on Saturday 2nd February at the CCB Europe Top 16 tournament in Montreux, Switzerland, for Frenchman Emmanuel Lebesson and Poland’s Li Qian, there will be no such rewards. Both experienced opening round defeats. In the men’s singles event, Emmanuel Lebesson, the no.10 seed, crowned European champion in 2016 in the Hungarian capital city of Budapest, was beaten by Sweden’s Kristian Karlsson, the no.8 seed in a battle of left handers who excel in the art of top spin attacking play; a five games verdict was the outcome (5-11, 12-10, 11-9, 12-10, 11-7). Defeat for Emmanuel Lebesson, soon after in the women’s singles event it was the end of the road for Li Qian, the winner last year at the Liebherr 2018 European Championships in Alicante and a decade ago in 2009 successful at the Europe Top 12 in Düsseldorf. The no.5 seed, she was beaten in seven games by Germany’s Petrissa Solja, the no.5 seed (9-11, 11-8, 12-10, 5-11, 5-11, 11-8, 11-8). In the second round for Kristian Karlsson, either Germany’s Timo Boll or Portugal’s Tiago Apolonia await; for Petrissa Solja she faces the winner of the contest between Russia’s Polina Mikhailova and Romania’s Elizabeta Samara.